How does the Stabilising Function change in Different Training Exercises and Contexts. Dynamic neuromuscular (true core) stability is necessary for optimal athletic performance and is not achieved purely by adequate strength of abdominals, spinal extensors, gluteals or any other musculature; rather, core stabilization is accomplished through precise coordination of these muscles and intra-abdominal pressure regulation by the central nervous system. In the event where stability, mobility and/or balance of these muscle groups become compromised, the ability to transfer force efficiently through the trunk to the extremities is often adversely affected and compensatory patterns develop. Hence, true core stabilization needs to be the key tenet of any training and conditioning program. The DNS approach serves as an important method for both assessment and training of muscles in all facets of their physiological function (purposeful movement and stabilization functions) by using positions determined by developmental kinesiology (DK). Young sportspeople are hyper-specialised in their sport and over-loaded in the sense that they repeat certain patterns continuously. Their Deep Stabilising System is dormant, and under-developed and therefore can’t cope. The DNS approach is based on comparing the athlete’s stabilizing pattern with the stabilization developmental pattern of a healthy baby with the intent of directing treatment to restore the impaired stabilizing pattern to as close as possible those ideal patterns as defined by DK. The DNS approach seeks to activate the DSS and restore ideal IAP regulation in order to optimize efficiency of movement and to prevent overloading of joints. Once an individual has learnt to activate the Diaphragm functioning properly, almost all activities would pass as a core exercise. The Transverse Abs together with the rest of the Abdominal Wall are supposed to perform an isometric or eccentric contraction when the core is properly activated. A functional movement pattern consists of; stabilisation, joint centration, full ROM and sufficient core stabilisation. Stabilisation of spine/chest/pelvis in sagittal plane. Sagittal stabilisation is a pre-requisite of any locomotor function. Sagittal stabilisation in practical terms means that we know how to differentiate the back and front of the body and the upper and lower limbs via stabilisation of thoraco-lumbar junction (TLJ). If we cant stabilize the TLJ, then we cant efficiently lift the legs, this is because the Psoas attaches to the lumbar spine, and we should be stabilizing the spine from inside via IAP. All abdominal exercises require this level of core stability. Lie on your back with your legs supported on a chair, or in constructive rest position. Have a book or firm cushion under your head. Place your hands on the sternum and follow your chest down for 6-8 breaths. Increase the size of the cylinder, check this by placing your fingers on the lowest segment of your abdominal wall just above the symphysis. Begin to allow your belly to push out/widen with the chest position travelling in a downward direction regardless of whether you are breathing in or out. Feel the overall length and width of your spine and back and pay particular attention to the energetic push into pelvic floor. A focus should be to line up the 3 diaphragms (vocal, thoracic, pelvic) as you are allowing the abdominal cylinder to expand. When this is optimal, slowly lift your legs so that your femurs are beyond a right angle, your knees are open and slightly diagonally abducted, with an emphasis on outward rotation. Continue to focus on the IAP expansion. Slowly lift your feet to the ceiling and continue to have the knees travelling towards your shoulders and diagonally away. It is essential that the length of your spine keeps pressing down. 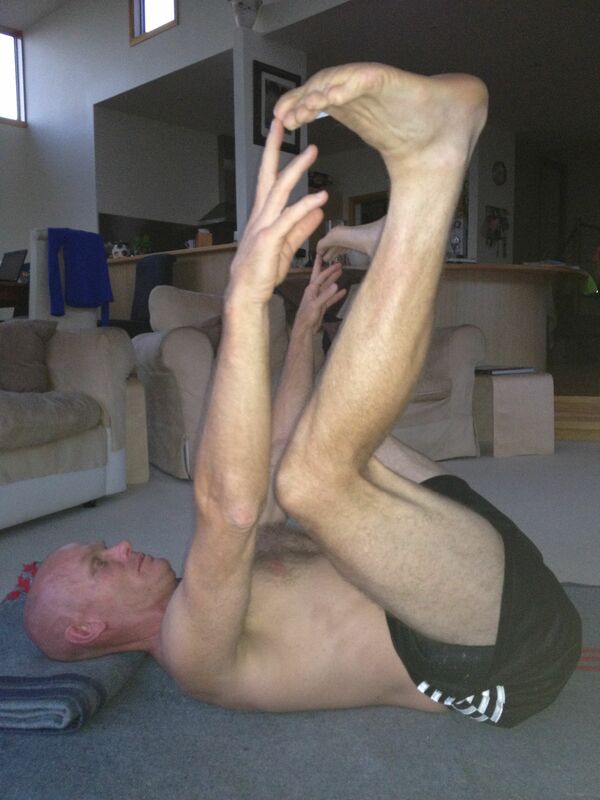 Bring your arms up as though you want to grab your big toes, hold this position and continue with expansion. Hold for 10 breaths, lower legs and arms keeping IAP size and with good coordination. Repeat 3-5 times. Ipsilateral stabilisation begins with the ability to reach across the midline of the body to begin turning or rolling and differentiates the left and right sides of the body. 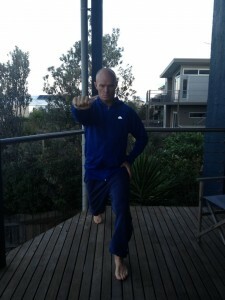 KB Rolling around long axis of the body with the extended arm as the fixed point. Lie on your back extend the right arm away with the KB pressing away. Lengthen the arm away from the body to infinity. Have the left knee bent. Start to fill the cylinder, and when stability is good bring your left knee up. Start by moving the knee, until the upper body follows. The next stage is when the head/neck lifts away from the blanket to keep looking at the KB. Finish in a shoulder on shoulder position with the knee next to support hand. Come back super slowly, pausing at any barriers or absences. Push the cable or band to full stretch and keep this as a push the entire time. Step back with rear leg, so that both legs are in line with respective hip. At the bottom of the lunge, both shins should be approximately vertical. The goal of the exercise is to lower the pelvis, while keeping the trunk vertical. It should feel as though you are lowering through the rear leg, with front leg and hand being the support. 3-5 slow reps each side. Stabilising function = the correct pattern of activation. Any purposeful movement involves stabilising function first. Muscle chains are pulling towards the base of support. Liquid ball stability: the liquid ball protects the spine from the font/back/above/below. Stabilise lower spine through IAP. Only way to do it.